So here is atekomi (something like "aim inside"). There are typically supporting stones nearby. 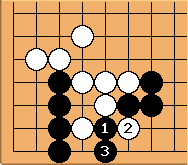 In English atekomi has also been called an angle wedge play. With a supporting stone at a Jared proposed the name Kosumi Cut, because the cutting stone is a kosumi and because it cuts opponent's kosumi. There are some cases where atekomi is a hard-to-find tesuji. 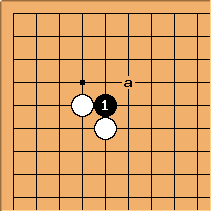 White can simply connect as an answer, so the tesuji usually has other aims in addition to separating the two stones, as in the examples below. is atekomi. Black can't protect at both a and b. This particular example happens to be a Clamping Tesuji as well, however, this would still be atekomi even if the marked clamping stone wasn't there. The atekomi, , connects underneath. 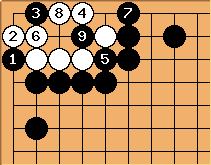 The atekomi, , sets up the eye killing play, . 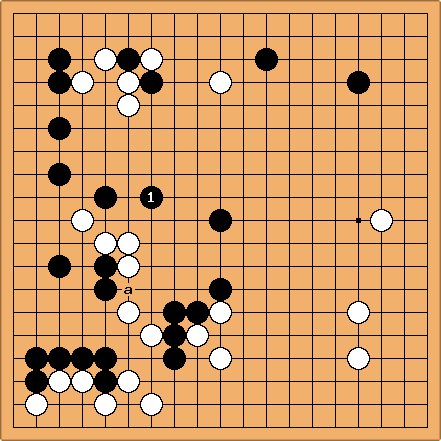 Black has just played and now white must try to escape. Perhaps white thought 'a' might work, but it does not. After , White is cut. 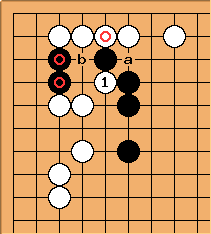 at 'a' or 'b' would fail; the Kosumi Cut works where other cuts do not.